How To Get The Best Out Of Your Money? This personal finance book helps millennials get a grip on their financial future. 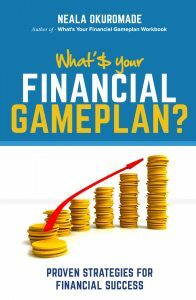 What’s Your Financial Gameplan? takes readers on a step-by-step journey to learn the principles needed to develop a solid financial strategy for their situation. Neala uses storytelling to bring alive money management techniques and does so in an enjoyable and easy-to-read format. Through the stories of four friends straight out of university who get the same job with the same salary, we see how they end up in different financial positions. What happened? One used his money to his advantage and ended up financially successful, another was able to pay off her mortgage much earlier than expected, while the others ended up in debt – and stressed and depressed. Neala packs this book with practical hints and tips. She even shows how creating wealth is accessible to anyone who is serious and willing to change the way they see and handle their finances. Implementing these techniques in the early stages of your financial life will set you up for financial success. Get This How To & Advice Book From Amazon. Neala Okuromade is the author of the What’s Your Financial Gameplan? series. Neala has been featured in/on Moneywise UK magazine, Informed Choice Radio, Faye Watts ‘Women In Finance’ Blog, Premier Radio and National Television/ Radio in Trinidad & Tobago. With over twenty one years’ experience in Business and Finance, Neala is a member of the ‘Association of Certified Chartered Accountants’. Her experience includes: Project Accountant for a large Property Company; a Financial Controller of a successful Property Exchange Service Company; and the Associate Director of Finance for one of the most reputable charities in England and Wales. Neala also delivers finance seminars in universities, colleges, schools and community centres. Empowering the everyday person to make a success of their personal finances, especially in today’s tough and chaotic economic climate is Neala’s mission.